Great Tiger. King Hippo. Von Kaiser. Men who have made an impact in history? I think not. These were opponents in the game Mike Tyson's Punch-Out. Like most boys growing up in the 1980's I was addicted to a little thing called the Nintendo Entertainment System. Everyday after school I would escape into a virtual land where I could eventually become Heavyweight Champion of The World. Despite only weighing 113 pounds and never having hit someone with a boxing glove, I could go to war. Living vicariously through Little Mac, with Doc Louis in my corner, I made it through and won the championship belt. Glory indeed. 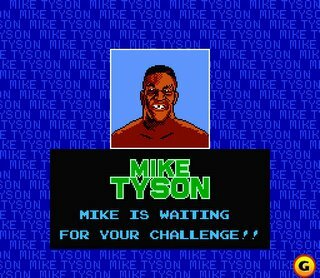 I really think this is why people are still fascinated by Iron Mike: cemented in the minds of many male Gen X'ers is the idea that Tyson was the man. We spent our childhoods trying to defeat him and we still view him as unbeatable. This image of Tyson [circa 1988, before he married the Head of The Class chick] dominates our minds, so that we still watch his fights in awe . . . or maybe we're just waiting for him to bite off another opponent's body part. I'm still not sure why we watch. For those, like me, who have spent years wondering what this video game would look like in real life, we now have an answer. Click here to find out.